Read on for information from the American Academy of Pediatrics on how to encourage positive eating habits and how to prevent food hassles. 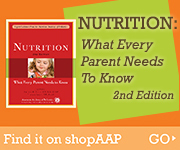 If you have specific questions about your child’s nutrition, talk with your child’s doctor or a registered dietitian. Set a good example. The best predictor of a child with a healthy weight and lifestyle is parents with a healthy weight who make wise food choices and exercise regularly. Get your child involved in meal planning. Read recipe books together. Put your child in charge of writing down a grocery list and go shopping together. During trips to the grocery store you can introduce new foods and also teach your child how to make healthy and nutritious choices. Ask your child to help with measuring out ingredients. Try to serve snacks and meals around the same time each day. Schedule at least one meal together as a family. Research suggests that having dinner together as a family on a regular basis has positive effects on the development of children. And time spent together can be fun and bring family members closer together. Remember to turn off the TV. Set up mealtime rules. Children who are anxious, excited, or tired may have trouble settling down to eat. Sometimes a simple “food rules” chart on the refrigerator helps to keep things in order. Examples of food rules include (1) come to the table with clean hands, (2) help when asked, and (3) do not make bad comments about food served or what others are eating. Well-meaning adults often view a child’s odd food and eating behaviors as a problem. However, childhood food jags, a fear of new foods, and other feeding challenges are usually a part of normal development. There’s no need to worry if a child skips a meal or won’t eat the vegetables on his or her plate. Keep the big picture in mind. Offer a variety of healthy, nourishing foods. Be creative! A variety of colors, kid-friendly shaped foods, and foods arranged on the plate in an appealing manner can entice children to try foods they might otherwise avoid. Provide nutritious snacks to help round out picky eating habits during meals. Over time, a child will get everything needed to grow and develop normally. Do not force your children to eat. While parents are the best judges of what children should eat and when, children are the best judges of how much they should eat. Food should be used as nourishment, not as a reward or punishment. In the long run, food rewards or bribes usually create more problems than they solve. Children often use the table as a stage for showing their independence. Sometimes food is not the issue at all. The eating process is just one more way children learn about the world. Active play, along with eating right, promotes good health…and a healthy appetite! And it is the best exercise for toddlers and young children. Make sure your child is hungry when mealtime comes. Offer only healthy snacks, and do not offer snacks too close to mealtime. Let your child eat what he wants if the jag food is healthy. Offer other foods at each meal before the jag food. Be patient. After a few days, your child likely will try other foods. Food jags rarely last long enough to cause any harm. Have whole-grain bread and rolls as well as fruit available at each meal, so there are usually choices that your child likes. You shouldn’t prepare separate meals for each child, unless you want to be a short-order cook. Don’t be afraid to let your child go hungry if she won’t eat what is served. Turn off the TV during meals. Watching TV during meals is a distraction that prevents family interaction and interferes with a child’s eating. Mealtime is often the only time during the day that families can be together. If your child whines and complains about the food offered, encourage her to eat what she can. If she continues to whine and complain, have her go to her room or sit quietly away from the table until the meal is finished. She can return and finish her meal only if she promises not to complain. If your child is hungry and wants to come back to finish eating, let her know that it’s good to have her rejoin the family. Avoid letting her take food away from the table to eat, return for dessert, or snack until the next planned meal or snack time. Encourage your child to eat what he can. Do not force your child to eat other foods. Giving more attention to finicky eating habits only reinforces a child’s demands to limit foods. Offer a variety of foods from all the food groups. Be patient. Eventually your child will move on to other foods. Model eating and enjoyment of new foods yourself by introducing new foods at each meal. Encourage your child to allow a small portion of the new food to sit on her plate instead of forcing her to try new foods. Be patient. It may take many tries before a child is ready to taste a new food…and a lot of tastes before a child likes a new food.